The London 2012 Olympics has taken its place as one of the most memorable sporting events in history. Now that its all over, why not carry on the excitement with this selection of official video games? Bring the magic of the London 2012 Olympic Games back into your home with these Olympic Games video games. Create your own sporting moments in Olympic events with London 2012 - The Official Video Game of the Olympic Games or join Mario and Sonic at the Olympic Games to go for Gold in a variety of headline events. These are the perfect Gift for video games fanatics or Olympic games followers!! Compete for your nation in track, Velodrome, swimming and over 45 other events. Practice your skills in the Olympic Games mode and play against your friends and family in a variety of multiplayer modes. Feel the burn with motion controls and compete online with the national leader boards. Experience the thrill of the Olympic Games with reactive commentary, super-realistic graphics and TV style presentation. 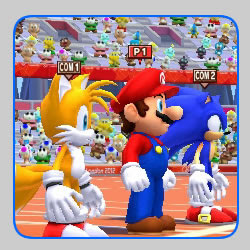 Mario & Sonic at the London 2012 Olympic Games is a Sports-Party game set at the 2012 Summer Olympic games in London featuring the characters from both the Nintendo and Sonic game universes who compete in a wide range of sports events.